Hopefully, by now, you have been able to navigate through our site and you have searched for useful information on options investing and strategies with our SmartSearchXL stock research tool. Hopefully by now you have discovered just what an amazing research tool you have here at your disposal. The SmartSearchXL tools for researching stocks allow our subscribers to search for profitable options investments by focusing on such criteria as option bid price, stock price, option volume, % return difference, % if assigned, % if not assigned, % probability assigned, Black-Scholes ratio, historical and implied volatility, average broker recommendation, beta, delta, and a partridge in a pear tree as well as many others. 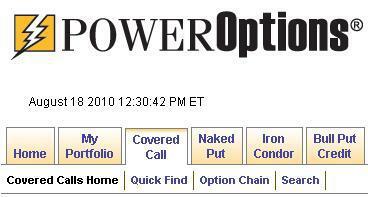 The PowerOptions site comes with saved parameter settings for In the money and Out of the Money values, and it also has several programmed stock lists such as S&P's, Dow 30's, IBD 100, Value Line's, Optionable Indexes and many more. These are just some examples that we have set up for you so you can see the value of the site. But please, don't feel as if that is all that can be done. Just as every investor has his or her own set of defining fingerprints, every investor also has a unique pattern for researching stocks and investing in options. If you have not done so yet, go to: https://www.poweropt.com/logon.asp. Enter your User ID and password then click the [Log On] button. The My Home page will appear. Select the tab, Covered Call, Naked Put, etc., for whichever strategy you are interested in researching. You should then see a page specific to the strategy selected. "Search" from the sub-tab menu. [Submit these Settings] and [Clear these Settings]. Click the [Clear these Settings] button. than box. Do not enter greater than or less than signs in the field boxes. section and you will see a long text box. button. When your parameters are set, click the [Save] button. Price", or "High Volume Search", etc. remember why you did that search or what that search should return. The description is optional. and can be selected anytime you logon to your account. You can create numerous different settings of differing parameters. [Log On] button. The My Home page will appear. parameters, select "Search" from the sub-tab menu. stock symbols for the list. new stock list is now saved. your saved criteria and are on the stock symbol list that you created.